People come up to me all the time and say “oh yeah, i know all the cheap flights tricks, I use the Skyscanner”. I smile, nod and think to myself “mmm cool, but that’s not what I do, and I’m kinda good at this stuff”. I use Google Flights. I start my searches long before I expect to book anything and I play around every few days. You should too. If you’re logged into your Gmail account, Google Flights takes on new levels. As you’ll soon see, you can let the deals come directly to you, right into your email inbox with the flick of a switch, or realistically speaking – the tap of a button. It’s awesome. There’s nothing quite like waking up to savings. If you’re going somewhere far, the more flexibility the better. Maybe Boston has $260 round trip flights to Spain, but New York is over $500. This is where Google Flights shines. You can enter up to five departure cities and five destinations for a single search. You’ll see the lowest price from all possible outcomes. Is it worth the savings to leave from somewhere else? That’s up to you..
Alerts are free, alerts are easy and you should 100% be using them. Whenever you search on Google Flights, you have the option of pressing a button which will track prices for your desired flights and email you when prices change. If you have any flexibility, like maybe leaving Tuesday instead of Wednesday, set alerts for each possible date of flexibility to improve your chances. You should also set alerts for premium economy or business class because you never know! Without setting a destination, you can see flight prices to places all over the world. This can be a really cool way to inspire your next trip, or change your perception of airline pricing, like “why is it cheaper to fly from Atlanta to Australia than Atlanta to New York?”. You can set criteria like “non-stop only” or only flights with a certain airline, and you don’t even need to put in dates! Just leave the destination field blank and Google Flights will do the rest. You can’t help but want what you want. Maybe you’re traveling as a family and only want direct flights, or are obsessed with Virgin Atlantic and only want to fly with them. Using the easy toolbar above flight results, you can exclude certain airlines, only select others, choose the amount of connections you find acceptable and also if you get hand luggage. You can then set price alerts with these preferences to ensure you don’t get any false excitement! Nope, not prying into your love life – just your fly life. 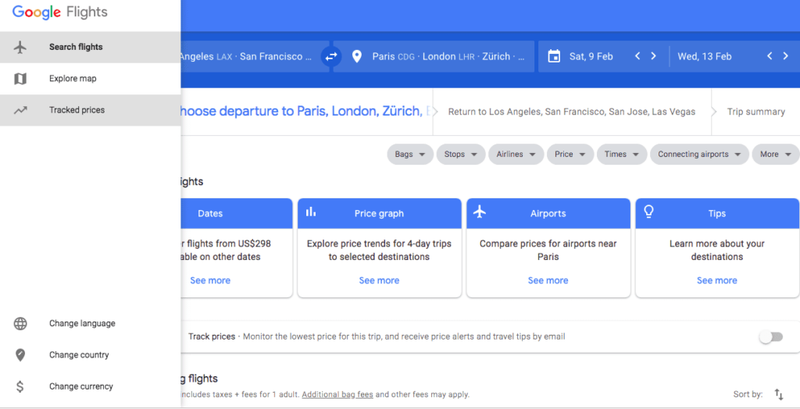 Google Flights has added a really useful “dates” tool which allows you to see a matrix of the lowest prices within a few days of what you searched for. In one click you’ll see the prices for every nearby date, which can help determine if that dinner with an old friend is really worth it, or if it’s better to save $300 on your flight. Thank you. Can you please add at what point the airline is made aware of demand for a flight based on Google Flights vs. ITA Matrix vs Expert Flyer vs other OTAs? Are all hits/searches captured/known immediately by the airline, or is the airline completely unaware until exactly what point? How can perceived demand affect prices?Are we shooting ourselves in the foot setting alerts? Good question. I too have always wondered about this.